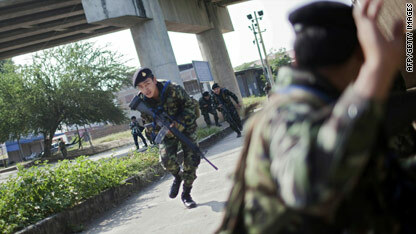 Thai troops run for cover as fire from the Myanmar side of the Thai-Myanmar border spilled into Thailand on Monday. About 10,000 people from Myanmar fled across the border into Thailand on Monday to escape fighting between Myanmar government forces and a splinter group of rebels of the Democratic Karen Buddhist Army, military and border officials told CNN. The rebels and Myanmar forces clashed over control of the town of Myawaddy, which sits across the Moei River from Mae Sot, Thailand. The Thailand-Burma Friendship bridge connects the two towns. Lt. Col. Vannathit Wongwai, commander of Thailand's 3rd Region Army, said Myanmar military officials told him they had retaken control of Myawaddy at 5 p.m. local time after bringing in 500 reinforcements to battle the Karen splinter group. At least five Myanmar refugees and five Thais were injured in the fighting. Shells fell on the Thai side of the border, but the Thai military did not return fire, military officials told the Bangkok Post. According to a report on the website Burma Election Tracker, the clashes began when DKBA militia members who had been employed as government border security troops rebelled because the Myanmar military was forcing people to vote at gunpoint. "In order to win votes in the elections, [the junta] is bullying and forcing people to vote. But the people want to boycott [the vote], so the soldiers are holding them at gunpoint and our troops had to intervene and take sides with the people," the website report quotes Brig. Gen. Na Kham Mwe, head of the breakaway DKBA faction, as saying. Polls were supposed to have closed Sunday in Myanmar's first election in 20 years, which critics have called a façade of democracy put forth by the ruling military junta. Opposition parties were either limited in the candidates they could run or boycotted the election altogether. The junta did not allow international monitors. The Karen ethnic minority in Myanmar is divided into two main groups, Buddhists who support the ruling junta and Christians who do not. Those behind Monday's clashes have split from the pro-junta group. If I remeber correctly and I do since I was around and there,it was JFK (D) who started the U.S. down the path in Southeast Asia.Then Jonhson(D) expanded the war effort.He Bailed out and it ended up Nixon(R) was left to lose the war in Vietam and pull out because the will to take more casualties by the U.S.was gone so the Communists overan everywhere.Millions of SV were murdered by the NVA after the takeover.Then you talk about Deception:Obama promised to end our involvement in Afganistan 2 years ago.PS we are still there,why? EUROPE/UK – Please Note!! These refugees are not muslims. You can let them immigrate without them planning to take over your government and convert or kill your citizens. Since you apparently want immigration, please STOP recruiting the muslims and give Myanmar refugees a break!!! PLEASE?? Repost: Western nations need to STOP all muslim immigration and recruit these refugees from Myanmar/Burma, PLEASE!! Thailand does not care because it already has been overrun with refugees in camps on its borders for years. Europe/UK wants immigration – please help these people do the paperwork! Muslims know the ropes & know how keep up the pressure to immigrate, then demand to end western freedoms. These refugees from Myanmar/Burma can appreciate western freedoms and could make peaceful citizens, but they do need connections so please assist them. I don't believe for a minute that the picture image you lead with here is from the current conflict as CNN claims ("Thai troops run for cover as fire from the Myanmar side of the Thai-Myanmar border spilled into Thailand on Monday.") There are no elevated freeways in the area of this conflict, iits not an urban area. Who is editing this story?.....unbelievable that CNN would superimpose such an image to the world that is not from the conflict it claims to be. Do you do this for all of your stories on Afganistan and Iraq....just grab any close image and publish? The photo posted for this story is an actual image of the current conflict in the Mae Sot/Myawaddy area. It looks like an elevated freeway, but it is actually the Thai/Myanmar Friendship bridge which spans the Moei River and connects Mae Sot to Myawaddy. Rob, that image is indeed correct. That is the so called "Friendship Bridge" between Myawaddy and Thailand. I was there in 2006, and after finding out I was from America, my cab driver asked when U.S.A. was going to come free them from their oppressive government/military. I was seriously holding back tears because he was dead serious, and there I was as a tourist with more rights and protection from their government than he had. The Burmese are desperate for freedom. The US doesn't ahve the resources or the back bone to help anyone in need. We can't even get it done in AFGH. I was born and raise in Burma in a small town of Burma inside Karen State. From 1970 to the time 1989 was hell in Burma, and the time now is no word to describe for the trouble of the people of Burma. When I came to west country, I study about "Justice, Society, Law, good Government and etc". As a man grown up in Burma, I do not see any positive side of the subjects I studied. Justice is the interest of just strong military group who rule the the country under gunpoint. People are lack of Education and wisdom of fair society. For the Regime rulling the country is nothing more than holding the power for their wealth and security. I have read the United State's "Decalaration of Independence" and I like the basic rights which all citizens must have in US, which are "Life, Liberty and Pursuit of Happiness", but all of those are lack in many parts of the world, not only in Burma. However, one may argue that "Life, Liberty and Pursuit of Happiness" is just American idealogy and it is not for any other society. In that case, I am willingly to debate that the very basic rights of mankind is not only American idea but that is God given rights to every mankind and every Humanbeing have right to declare their rights. Government can not give human rights; Human rights are born at the same time with humanbeing. I onces read that "Law is order back by threat", it is so true in Burma. Regime law is nothing more than threat; law is not to serve justice or fairness. After cyclone Nagis hit Burma, alot of good samaritan such as Zarganar were persicuted for humanity work and sentenced to more than 40 years in prison. The crime those people did was distributing needed food and clean water for the needed cyclone victims. Speaking against the regime is seriously forbidden and studying political idealogy is a crime. Many political books are illegal in Burma. If you are reading this comments, ask yourself, can you live in that kind of society? Are you not responsible as a humanbeing for the suffering of other humanbeing in different parts of the world? Some how I know that China, Singapore, Thailand, Vietnam, North Korea, South Korea will part with Burmese regime. What I write here is just tiny little information of Regime Human Rights abuses. It is just like a drop of water into the ocean. Obama administration also is responsible for Burmese regime election. I like to ask Obama and Secretary of the State Clinton for their "Carrots and Sticks" policy toward Burmese regime. Carrots is gone, where is the sticks? Please leave your political interests behind and do something right for Burmese people please. Thank you. I love their roadside shaving cream ads ! well, kid, the world is just a messed up place with no real solution is sight. I think you should sit back, and watch the barbaric world from your comfortable chair. Just enjoy the freedoms you preach about, and try not to think about the stink of the landfill nearby, which, after all, exists because the world needs somewhere to put its garbage. Yes, when times get tough the smart ones move somewhere else. It is shameful, but Manny is right. That's what our world, society, and for the most part, our lives have become. To those who are saying American politic is not so different from Myanmar's, let me ask you a question to induce some serious thinking on the issue – In America, can anyone of the relatives of those in power or those in power itself SLAP a traffic police senselessly because the officer stop them for driving over speed limit? Because, in Burma, they CAN without any repercussion. How do I know that? Because, I've been there long enough to know all the unjust deeds forced upon civilians by those in power.